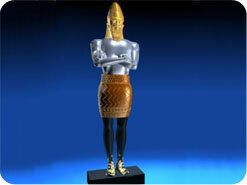 King Nebuchadnezzar gave the signal, and as the music from a thousand instruments began to swell, the curtain fell, exposing a dazzling, 90-foot image of gold glimmering in the sunlight. Then, according to King's command, all the officials who had gathered on the plain of Dura fell prostrate to the ground in devout worship. All bowed down except three young Hebrew men, who were servants of a greater King. Nebuchadnezzar was beaming with pride and satisfaction until it was reported that Shadrach, Meshach, and Abednego had refused to bow and worship his image. 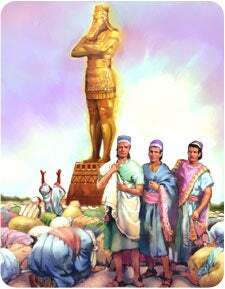 Astonished that anyone would dare to disobey, Nebuchadnezzar assumed these young advisers must have misunderstood his decree. So he offered them one more chance to bow down but they refused! Now the king's expression turned to rage. He ordered his soldiers to heat the nearby furnace seven times hotter than normal. As fuel was piled onto the fire, the three men were firmly tied with ropes. The resulting heat was so intense that it killed the soldiers who threw them into the blazing inferno. As the king peered into the roaring furnace, his mouth suddenly fell open. With a trembling voice he asked, "Did not we cast three men bound into the midst of the fire?" His counselors agreed that they had. Then the king said, "I see four men loose, walking in the midst of the fire, and they have no hurt and the form of the fourth is like the Son of God." Daniel 3:25. 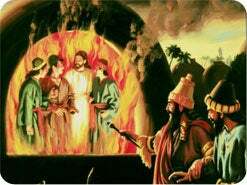 God delivered those brave young men in the fiery furnace because they stood up for His truth. In the last days, God's people will have to face a similar test. 1. How does our story in Daniel 3 relate to Revelation? Revelation 13:15. As many as would not ______ the image of the beast should be killed. 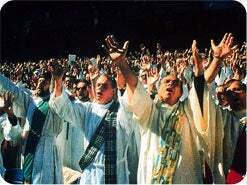 NOTE: In the last days, God's people will be forced once again to worship contrary to conscience or be slain. They will have to choose between obeying the law of God or the laws of man. 2. 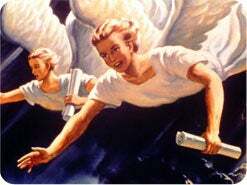 What are the three angels' messages of Revelation 14? Revelation 14:7. Fear God, and give glory to him; for the hour of his _________ is come: and worship him that made heaven, and earth, and the sea, and the fountains of waters. Revelation 14:9,10 If any man worship the beast and his image, and receive his mark in his forehead, or in his hand, The same shall drink of the wine of the wrath of God. NOTE: The Bible tells us in Revelation 14:6-14 that in the last days, this awesome three-point message of hope and warning will go to the entire world to prepare people for Jesus' return. One of these messages warns against worshipping the beast and receiving its mark. In this lesson, we will identify the beast. In Lesson 14, we will identify the mark. Eternal life itself may be at stake, so pray earnestly for God's guidance and understanding as you study. 3. 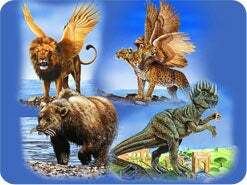 What does a beast represent in Bible prophecies? Daniel 7:23. The fourth beast shall be the fourth ________ upon earth. 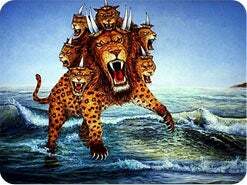 Daniel 7:17 These great beasts, which are four, are four kings. Daniel 8:21 And the rough goat is the king of Grecia. NOTE: In Bible prophecy, a beast represents a government, kingdom, or political power. God uses beasts to symbolize governments, as we do today--an eagle (the United States of America), a bear (Russia), etc. In the Bible, "beast" is not a disrespectful term. It does not suggest beastly characteristics. The beast that has the mark is pictured in Revelation 13:1-10, 15-18. Please take time to read these verses before proceeding to question 4. 4. How does the Bible identify the beast? Revelation 13:1. And I stood upon the sand of the sea, and saw a _______ rise up out of the sea, having seven heads and ten horns, and upon his horns ten crowns, and upon his heads the name of blasphemy. NOTE: In Revelation 13:1-10, 15-18, God gives 10 clues to help us identify the beast. He gives us a long list of characteristics so that we can be absolutely certain of the beast's identity. Only one power fits all 10 of these identifying marks--the papacy. But in order to be certain, we will carefully consider them one at a time, beginning with question 5. 5. This beast arises from the sea. What does the sea, or water, symbolize? Revelation 17:15. The waters which thou sawest ... are _______, and multitudes, and nations, and tongues. NOTE: In prophecy, water represents great multitudes of people, or heavily populated areas. Prophecy predicted that the beast would arise from amid the established nations of the then-known world. The papacy arose in western Europe, so it fits Point 1. But what about the other nine identifying points? 6. Who gives the beast its power and position? Revelation 13:2. And the _______ gave him his power, and his seat, and great authority. 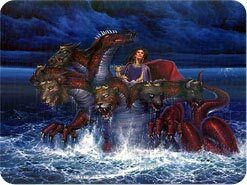 NOTE: The beast--which has a mark that we must avoid--obtained its power, authority, and capital city from the dragon. According to Revelation 12:3-5, the dragon is the power that sought to destroy the child Jesus at the time of His birth. It was Satan who inspired Herod, a king for the pagan Roman empire, to slay all the male babies in Bethlehem (Matthew 2:13, 16). To whom did pagan Rome give her authority and capital city? 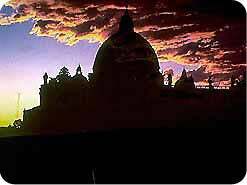 History is clear that pagan Rome turned over its power and capital city to the church of Rome. The following historical quote is typical: "The Roman church ... pushed itself into the place of the Roman World-Empire, of which it is the actual continuation. ... The Pope, who calls himself 'King' and 'Pontifex Maximus,' is Caesar's successor. "* So Point 2 fits the papacy, as well. *Adolph Harnack, What Is Christianity? (New York: Putnam, second edition, revised, 1901), p. 270. 7. How far-reaching is the influence of the beast? Revelation 13:3. And all the _____ wondered after the beast. NOTE: No one would question that during the Middle Ages, the papacy was indeed a worldwide power. In fact, the word "catholic" means "universal." We can see that Point 3 also fits the papacy. 8. What comes out of the mouth of the beast? Revelation 13:6. 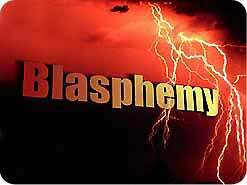 And he opened his mouth in ________ against God, to blaspheme his name. The papacy also claims that the pope is equal with God. Pope Leo XIII said, "We [the popes] hold upon this earth the place of God Almighty. "2 Here is another startling statement about the pope: "Thou art another God on earth. "3 So Point 4 also fits the papacy. 2Christopher Marcellus, Oration in the Fifth Lateran Council, Session IV (1512), manuscript SC, Vol. 32, col. 761 (Latin). 3Pope Leo XIII, Encyclical Letter "The Reunion of Christendom," dated June 20, 1894, trans. in The Great Encyclical letters of Pope Leo XIII (New York: Benziger, 1903), p. 304. 9. How long would this first beast rule? Revelation 13:5. And power was given unto him to continue _____ and ___ months. NOTE: Remember that in prophecy, one prophetic day equals one literal year (Ezekiel 4:6). This time period is repeatedly referred to in prophecy as three and a half years, 42 months, or 1,260 days. Based on the 30-day calendar used by the Jews, all three time periods total the same 1,260 prophetic days, or 1,260 literal years. 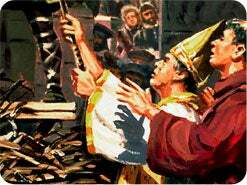 The worldwide power of papal Rome became official in A.D. 538, when Emperor Justinian's decree making the papacy supreme was no longer opposed. 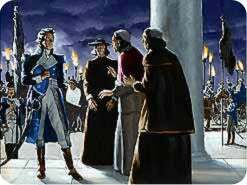 The papacy was dealt what appeared to be a death blow in 1798 when the pope was captured by Napoleon's general, Alexander Berthier. You will notice that the time period between A.D. 538 and 1798 is precisely 1,260 years. Point 5 also fits the papacy. 10. What happened to the beast after the 42 months? Revelation 13:3. And I saw one of his heads as it were __________ed to death; and his deadly ______ was healed: and all the world wondered after the beast. NOTE: As already mentioned, the papacy received what appeared to be a deadly wound in 1798 when General Berthier took the pope captive to France, where he died in exile.1 Half of Europe thought that this event signaled the end of the papacy, but God had said that the wound would be healed and that the papacy's power and influence would be restored until the entire world would follow her leading. Malachi Martin, consummate Vatican insider, reveals the following in his book The Keys of This Blood: "The pope is the best-known person of the 20th century (p. 123), has formed personal relationships with the leaders of 91 countries (p. 490), and is prepared for worldwide rule now" (p. 143).2 Even a novice would recognize that today the papacy is, in many ways, the most influential power on earth. And with each trip the pope makes, his power and influence grow. Multiplied millions worldwide look to the papacy as the only hope for world unity, peace, and decency--precisely as God predicted. The papacy clearly fits Point 6. 1Joseph Rickaby, "The Modern Papacy," Lectures on the History of Religion, (London: Catholic Truth Society, 1910), Vol. 3, Lecture 24, p. 1. 11. 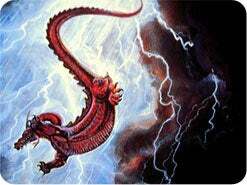 Is the beast a religious power? Revelation 13:15. And cause that as many as would not _______ the image of the beast should be killed. NOTE: It is obvious that this entity would be involved in spiritual matters. 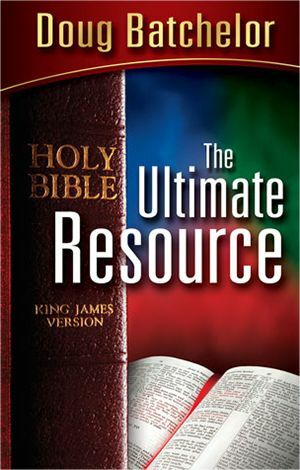 The words "worship" or "worshiped" are used five times in Revelation 13 in reference to this power. Surely no one doubts that the papacy fits Point 7. 12. What does the beast do to the saints? Revelation 13:7. And it was given unto him to make war with the saints, and to _________ them. NOTE: It is common knowledge that the papacy did persecute and destroy conscientious Christians, especially during the Middle Ages, the peak period of its control. 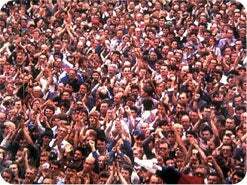 Many historians say that more than 50 million people died for their faith during this period of great tribulation. Apparently the church felt it was doing God a favor by stamping out "heresy." The pope has asked that the church be forgiven for its atrocities, but the fact remains that it did persecute and destroy. The papacy fits Point 8 also. 13. What is the mysterious number that identifies the beast? Revelation 13:18. His number is __________ hundred threescore and ______. There should be no doubt remaining. We have shown that all 10 characteristics portrayed in Revelation 13:1-8, 15-18 fit the papacy. And this power has a specific mark that we dare not receive. Now please note that there are many godly, loving Roman Catholic Christians whom God counts as His children. 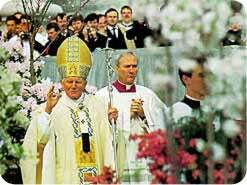 There have also been many gracious and courageous popes who loved God. This lesson is not an attack upon our Catholic friends. It is an attack upon the devil, who lures churches away from scriptural truth. However, God Himself has told us that this institution has a mark we dare not receive. Sincere Protestants, Catholics, Jews, and non-Christians will all be eager to discover what this mark is so they can avoid receiving it. Let's thank God that in His word He has exposed Satan's ugly plans to destroy us all. In our next lesson, we will clearly identify the "mark" of the beast. If you receive the mark of the beast, you will be lost. Many will discover that avoiding the mark will involve a tremendous struggle. 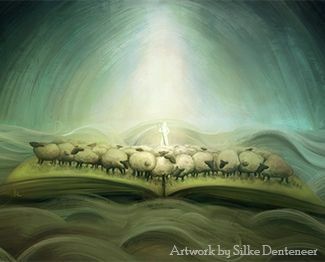 But God can give us the faith of Shadrach, Meshach, and Abednego, who were willing to face death in order to honor God. 14. Are you willing to follow Jesus wherever He leads, even though you may lose your friends?